Money Makeover | David and Heidi Copeland of Seattle felt uneasy when they began thinking about how and when to wind down their long careers and retire to Eastern Washington. An increasingly scarce employee benefit — the pension — will be key to making their plans real. Only 17 percent of Americans age 25 and older are very confident that they will have enough money for retirement, according to a 2018 survey by the Employee Benefit Research Institute and Greenwald & Associates, a research firm. Another 47 percent of the survey’s 2,042 respondents said they felt somewhat confident about their retirement finances. So it was understandable that David and Heidi Copeland of Seattle felt uneasy when they began thinking about how and when to wind down their long careers and retire to Eastern Washington. The transition involved a series of decisions that weighed on David. “I worry at night so the rest of the world can sleep,” he said. As it turned out, the Copelands can afford their retirement dream — barring catastrophe — largely because of an old employee benefit that is retreating from the workplace. Seattle’s soaring real-estate values also worked in their favor. Heidi in 2018 marked her 30-year anniversary as a registered surgical nurse at UW Medical Center in Seattle. She earns about $113,000 a year after taxes. The work is physically demanding, starting with the hard hospital floors that Heidi stands and walks on every shift. Now 55, Heidi is starting to think about when to retire and do something else. David, 54, is a part-time classroom assistant with the Mukilteo School District. He brings home an estimated $15,000 a year after taxes. David loves his work. “It’s the best low-paying job I’ve had,” he said. The couple have no children. The Copelands accumulated most of their assets by staying invested in residential real estate for more than 20 years, a span that included the 2008 financial panic and housing crash. 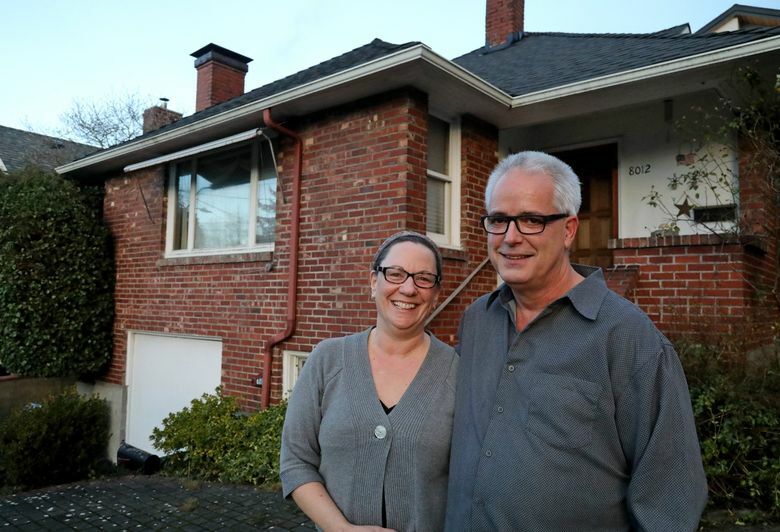 Heidi and David bought their North Seattle home in 1996 for $187,000, according to King County property records. The house is currently appraised at $747,000 for tax purposes, and Zillow estimates the market value at $842,000. When Heidi was single, she bought a Fremont condo in 1992 for $70,000. After marrying, the couple considered selling the condo, only to reject the idea. That turned out to be a good call. The taxable value of the Fremont condo is now $357,000, and it generates $17,340 in rental income annually. The Copelands paid off the mortgage long ago. In preparation for their eventual retirement, the couple bought a residential lot on Lake Chelan that’s valued at $194,600. They plan to build a home on the property and live there when they quit working. Their only debt is the mortgage on the North Seattle house. Heidi and David currently owe about $208,000, with an interest rate of 4.375 percent. The rest of their assets are in bank accounts. They have about $284,000 in a savings account that pays 2 percent interest. The Copelands have another $97,400 socked away in other bank and credit-union accounts, as well as savings bonds. Given their assets, retirement on Lake Chelan seemed to be an achievable dream, the Copelands thought. Still, nagging questions remained. What if the Copelands retire before they can begin collecting their Social Security benefits when each of them turns 62? If they want to go back to work, could they find jobs in Chelan? Can they afford the rising cost of health insurance and health care, especially in the expensive individual market? Last summer they sought advice by applying for a Money Makeover through The Seattle Times. The Financial Planning Association of Puget Sound connected the Copelands with Matt McKellar, founder and CEO of MyICON, a financial-planning and wealth-management firm in Kirkland. McKellar advised the Copelands for free. After poring over the Copelands’ financial information, McKellar liked what he saw. “They’ve done a good job of socking things away,” he said. McKellar noticed that neither David nor Heidi had individual investment accounts for retirement. But they had something else that proved instrumental in making their retirement plans possible — pensions. David can expect to collect about $5,250 a year from a defined-benefit pension provided by the International Brotherhood of Teamsters. He earned the benefit years earlier while working at a former Associated Grocers distribution center in Tukwila. As a UW employee, Heidi’s 30-year work anniversary made her eligible to collect about $55,000 a year before taxes under the Public Employees Retirement System Plan 2, or PERS 2. It’s a traditional defined-benefit plan. Employers and employees contribute to the plan, and workers get a lifetime benefit based on their final salaries and years of service. The couple’s combined pension benefits of about $60,000 a year made an enormous difference in their retirement projections. But the Copelands’ pensions are increasingly out of the ordinary; defined-benefit plans have been gradually disappearing from the workplace for nearly 40 years. In 1980, 38 percent of all private-sector workers were enrolled in defined-benefit plans, according to a 2009 study by the Social Security Administration. By 2012, only 10 percent of private-sector workers age 22 or older were enrolled in the plans, according to an analysis of census data by the Pew Research Center. Traditional pensions are being replaced by defined-contribution plans, such as 401(k) and 403(b) accounts. Under those plans, employees and often employers contribute to a worker’s retirement account. At retirement, the accumulated money — along with investment earnings — is available to the worker. Defined-contribution plans now have a market share once held by traditional pensions two generations ago. Thirty-eight percent of private-sector workers age 22 or older were enrolled in defined-contribution plans in 2012, according to Pew Research. UW offers a 403(b) plan, and McKellar had some advice about the plan for Heidi. Summarized simply, his advice was: Sign up! Though late in her career, Heidi can enroll in the university’s defined-contribution plan and contribute 10 percent of her salary, tax-deferred. The university will match that contribution, dollar for dollar. “Let’s not leave any money on the table,” McKellar said. Before working with McKellar, the Copelands had nearly $75,000 invested in a mutual fund at a brokerage firm. But the market volatility of recent months was becoming increasingly worrisome for the couple. “This stuff is making me crazy,” David recalled thinking at the time. To the Copelands’ surprise, McKellar affirmed their desire to dump the mutual fund and flee the stock market. They liquidated their stocks Nov. 29 and deposited the money in their bank accounts. It was a peace-of-mind move. Over the span of the next 15 days, the Standard & Poor’s 500 index fell 5.08 percent. One question weighing on the Copelands was whether Heidi should choose a pension benefit that would include a spousal benefit for David if she should die first. Doing so would reduce her own pension payments during her lifetime. McKellar crunched the numbers and advised Heidi to claim her full pension. His projections showed that David would be fine without Heidi’s support benefit. Meanwhile, Heidi would be better off with a full pension to utilize the higher income stream during their retirement. The Copelands say their time with McKellar was a source of relief. “I feel a lot better,” Heidi said. McKellar summed up his assessment of the Copelands’ finances with a twist on a familiar metaphor.